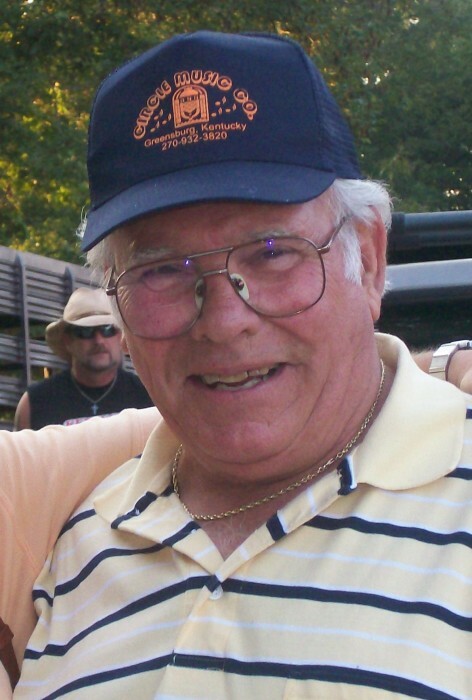 Joe Davis was born March 4, 1934 in Green County, KY to the late Edgar Daniel Davis and Genevee Tucker Davis. He departed this life Tuesday at his home in the Grab Community of Green County, having attained the age of eighty-four years, seven months and five days. He had made a profession of faith in Christ and was a member of the Oak Grove Separate Baptist Church. He was a United States Army Veteran, serving during the Korean War. He was a member of the James L. Pruitt VFW Post 5813 Greensburg, KY and the Rod Lowe American Legion Post 124, Greensburg, KY. He was owner and operator of Circle Music. He was preceded in death October 17, 1989 by his wife Rowena Mae Lindsey Davis. Besides his parents, he is also preceded in death by one daughter: Sissy Davis, two grandsons: Shawn Owens and James “T-Bo” Davis and two brothers and one sister: J.C. Davis, Betty Nell Russell and Stanley Davis. He is survived by two daughters and four sons: Sherry, Tom and Jeff Davis and his wife Peggy, PeeWee Davis and his wife Mary Lee and Joey Davis and his wife Tammy, all of Greensburg, and Jean Cheatham of Hodgenville, one aunt: Sunshine Tucker, twenty-one grandchildren, forty-two great grandchildren and eight great-great grandchildren. Honors provided by the Marion County Honor Guard.